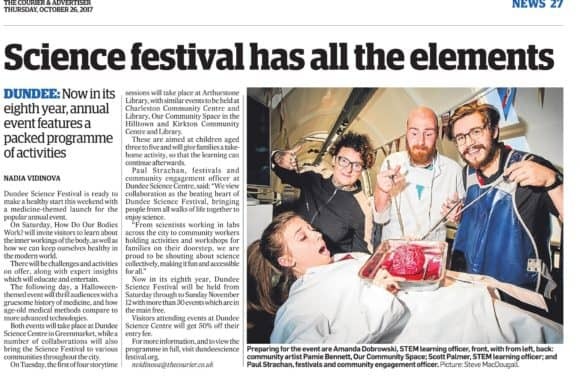 From the gory history of medicine to keeping our hearts healthy in the modern world, a community-wide celebration of Dundee’s medical world will inject fun into Dundee Science Festival’s launch weekend. This Saturday, 28 October, ‘How do our bodies work?’ will invite visitors to discover the inner workings of their bodies with lots of challenges, activities and expert insights. The following day, Sunday 29 October, a Halloween themed event will amaze audiences with the gory and gruesome history of medicine, and how old-age medical methods compare to more advanced technologies. Both events will take place at Dundee Science Centre from 10am until 5pm, with 50% off standard entry fee each day. Community collaboration will once again be at the fore on Tuesday 7 October when the first of four Storytime Sessions will take place at Dundee’s Arthurstone Library. Similar events will be held at Charleston Community Centre and Library, Our Community Space (Hilltown) and Kirkton Community Centre and Library. A brand new activity for Dundee Science Festival, they will take early years children (age 3-5) on a journey of discovery alongside their friends or families in familiar, community spaces. With a take-home activity, families and their little bookworms can continue the learning at home. Now in its eighth year, Dundee Science Festival will descend upon the city from Saturday 28 October through to Sunday 12 November 2017, with over 30 events designed to entertain, inspire and fascinate, most of which are free of charge. Visitors attending events within the host venue of Dundee Science Centre will enjoy a 50% discount on their entry fee.